Hi there Easel users! You might have noticed that Easel looks a little different today. We’ve made some adjustments to the interface and I wanted to explain what’s new. 1. Make it easier to adjust important settings like material, bit size, and material dimensions. 2. Lay the groundwork for more precise cut settings based on the combination of material and bit. You’ll notice that we’ve added a second level toolbar, with design components on the left, and project-specific settings on the right. Material and bit size are the most important factors for any project, so it made sense to make these prominent and easy to change. Material dimensions are also now set independently of the material, so if you set specific dimensions, then change the material type, the dimensions will stay the same. 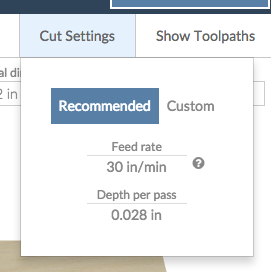 Feed rate and depth per pass have been moved into this Cut Settings dropdown. You can use our recommended settings or set your own custom values. Currently, the recommended settings for each material are general values that should work with a variety of bits. Over time, we’ll be making these values more precise, and have been testing a variety of bit/material combinations to determine the settings that work best. black friday shopping don't miss discount price shoes.